According to the Sleep Study Delhi, about 70% are affected by chronic sleep disorders and discrete sleep problems which can significantly affect health, alertness and safety. Untreated sleep disorders can lead to heart disease, hypertension, depression, stroke, diabetes and other chronic diseases. Sleep problems have many forms and can involve too much sleep, too little sleep or inadequate quality of sleep. Sleep problems and inadequate quality of sleep can affect everything from productivity to personal behavior and relationship problems. Sleep Disorders can cause serious consequences. In today’s hectic life, many people often overlook or ignore sleep problems due to which there is an abundance of people suffering from sleep disorders remained untreated and undiagnosed. 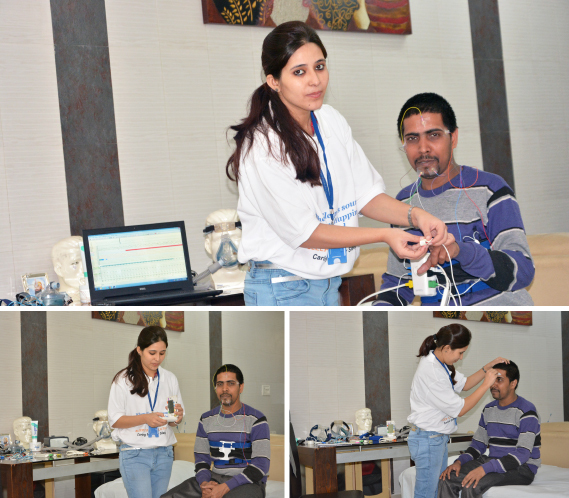 At our Sleep Study Delhi, we offers best sleep treatment to our patients to live a healthier life. Sleep study is a test is used to diagnose sleep disorders which is usually an overnight observation of an individual’s sleep. Sleep Study requires monitoring various physiological parameters simultaneously like the eye moments (EOG), EEG (brain activity), nasal flow(breathing), the chin tone(EMG), heart rhythm(ECG), oxygen level. Sleep is not a single process. It involves various stages like REM sleep (dreaming sleep) and Non REM sleep which involves three stages. The nature makes sleep like an orchestra with different notes at different points and disorders like Sleep Apnea outrage this rhythm. This can be easily decoded by a well conducted comprehensive sleep study. During this Polysomnography test, Specific equipment’s are attached to you to monitor your brain activity and lungs, arm, heart and leg movements, blood oxygen and breathing patterns levels while you are asleep. WatchPAT is an PDA-approved diagnostic device that uses innovative technology to ensure the exact detection of sleep apnea. Home sleep study test is quite popular mainly because it is quite easy to use and is greatly complemented by the fact that Watch PAT testing can be done in the comfort of your bedroom. Aviss Health is the leading sleep centre in delhi / gurgaon providing sleep disorder services for sleep study delhi or around the world. Aviss Health has now become the leading sleep centre for the manual sleep disorder solutions, making a real impact on your sleep without affecting the quality. Talk to us to know more about our experienced, proficient and award winning manual sleep scoring service or sleep study delhi.